Here is the full recipe for tagliatelle with fassona meat ragù and truffle, made with Petti tomato. Try it at home! Tagliatelle with meat ragù is a typical Italian recipe from Bologna, a city located in Emilia Romagna region in Northern Italy, easy to cook and enjoy for Sunday lunch or a special dinner with friends. Here is a variation of the traditional recipe: tagliatelle with fassona meat ragù and truffle made with Il pregiato, Petti’s organic datterini passata flavoured with white truffle. This is an easy-to-make recipe you can cook to bring the unmistakable flavor of the Italian cuisine on the table, mixed up with the flavor of high quality tomato passata flavoured with white truffle. Fassona is a breed of cattle used to make a delicate meat with a very tasty and intense flavor, typical of Piedmont region in Northwestern Italy. What’s different from the traditional Bolognese recipe? The use of white truffle is what gives this recipe a gourmet flavor, which make it more delicate and perfect to be served on a very special occasion. Find out the full and tasty recipe for tagliatelle with fassona meat ragù and truffle! Clean and chop the vegetables to make a mirepoix. In a high sided pan fry the vegetables with oil. After a few minutes add the meat, deglaze with red wine and mix. When the wine has evaporated, add Il pregiato, Petti’s organic datterini passata flavoured with white truffle and the cup of stock. Cook with the lid on for about an hour over low heat, stirring often, then add salt and pepper only after cooking. Cook the tagliatelle noodles in salted water (you may want to put a tablespoon of oil in the water oil), still al dente put them in the sauce pan to finish cooking and to ensure that they gain flavor. 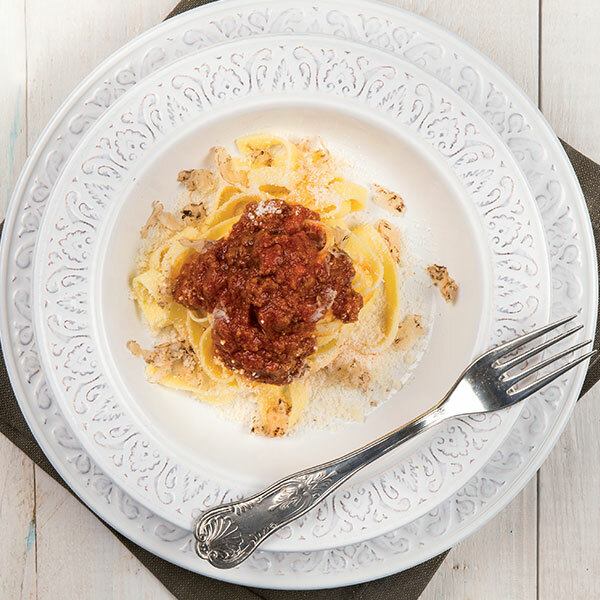 Serve the tagliatelle with fassona meat ragù with fresh white truffle shavings.